A small fleet of pods arrive at the Moon and stop in orbit around it. 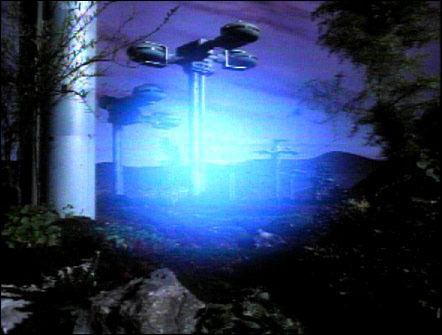 The Alphans bring two of the pods down to Alpha and discover them to be life pods containing exiles from the planet of Golos, the peace planet. The exiles tell how they were cast out during an uprising on their planet and ask for sanctuary. Alpha is unable to support the extra people so the Golosians offer to expand the capacity of the life support system using their superior knowledge. It soon becomes clear that the exiles are not telling the true story of the events on Golos and their intentions are not benign -- they plan to drain all the energy from Alpha's life support systems on a quest for revenge against their homeworld. View of a Golosian city. The light is the exiles' beam, which transported them from Moonbase Alpha to Golos.